I pray that you never have to be a short order cook. I pray that your children always eat all their veggies in order to get their ice cream. My hope would be that you can say “eat this or eat nothing at all” at dinner time, and your child will eventually give in. Or at least they’ll eat breakfast the next morning. I am full of hope that your aversion to being a short order cook always overpowers your child’s aversion to all things green. But it might not. Maybe you have a picky child who simply does.not.like.peas. Maybe you have one, like Mr. C, who will eat anything in sight and always has. Or maybe you have a child like Baby M, who is 14 months and still nursing exclusively because he is just not ready for solids yet. Or maybe you have a child like A-Man who physically cannot tolerate the different textures in many foods. Or like a child I babysit for who cannot tolerate to eat anything brown. Sweet mama, I was just as determined to never be a short order cook. I looked down on moms who constantly gave in to giving their child whatever snack ten minutes after they refused their well balanced meal. I was sure that I would never, ever, let my children behave in such a way, or have such a fit over something as silly as food. I mean, they should be grateful they’re fed, shouldn’t they? Oh how I wish I knew this years ago, well before I had a son who would only eat chicken nuggets if they were from McDonald’s or Banquet. A son who will devour nearly any fruit, but will not go near a vegetable. A son who has a panic attack if he is presented with pasta. Because it isn’t behavior. It isn’t a fit. Many SPD kids have serious meltdowns where they lose complete control when faced with different textures. Maybe if I knew that, I wouldn’t have listened to the well-meaning friends, family, doctors, and even strangers telling me “if that’s all you give him he will eat it”. Maybe if I knew this earlier, I would look at those moms with a child throwing a tantrum over a cracker with compassion and understanding instead of superiority. Maybe I would have smiled at the child whose senses were so overloaded that they were losing control instead of judging them as “spoiled”. Maybe I would have recognized that lack of control in my own son, instead of believing that it was defiance as I did for so long. Again, I pray that you are always able to deny short order requests. I pray that you are able to tell your child “no dessert unless you eat your veggies”, and it prompts your child to eat said veggies. However, I also pray that next time you see a mom giving yet another cracker to her tantrum throwing toddler, you offer her a smile instead of judgement. I pray that you have patience for the parents who don’t really want to accept dinner invitations because they doubt you will be serving something their child eats, and bringing their own food would be rude. Overall, mama, just have patience for others who are short order cooks. So what do you think? Are you a short order cook, or do your children eat what you serve no matter what? I think many of us moms will do whatever we can to help a child in tantrum (or to help our own sanity!). We become short cooks if we have to, right? But, on another note, I agree, how moms need compassion from the onlookers when a tantrum (rather from not wanting to eat or for any other reason) is happening! This article hit home as I have an SPD son. He will eat tons of carbs and tons for fruit, but veggies or meat will turn into a head banging meltdown or he will vomit if it goes in his mouth. I always said I would never be a mom who made separate meals and judged those who gave in. I tried to send him to bed hungry and we ended up living on pedicure until we discovered his diagnosis and received OT and feeding therapy. I look back and think of all of those times I judged others and feel guilty. My son has challenged me in so many ways, but made me a better person. He has taught me to be more compassionate and have more patience than I ever dreamt. One day with lots of work I will celebrate the fact he ate a carrot or chicken nugget. And one day we will be able to stop ordering dominos gluten free pizza the ONLY pizza he will ever eat. Thanks for your letter I truly understand and love it. I have fairly severe food aversions. My mom says I’m just picky, but that’s not the case. Once, I vomited from biting into a chunk of onion in tomato sauce and I am fairly resistant to vomiting. Considering the wide range of foods I am averse to, I know that this is a genuine processing issue for me. I seem like I have no other issues, but food is a low point for me just as sound might be. It seems that sensory overload from something loud and bright (e.g. a concert band) is more understood than sensory overload from food. You are so right. I am a picky person, I really don’t like a lot of different foods. A-Man, though, has a full blown panic attack when presented with pasta. Baby M has thrown up from trying to eat solids when he wasn’t ready for them. There’s a big difference between picky (me) and true food aversions! Thank you so much for writing this. 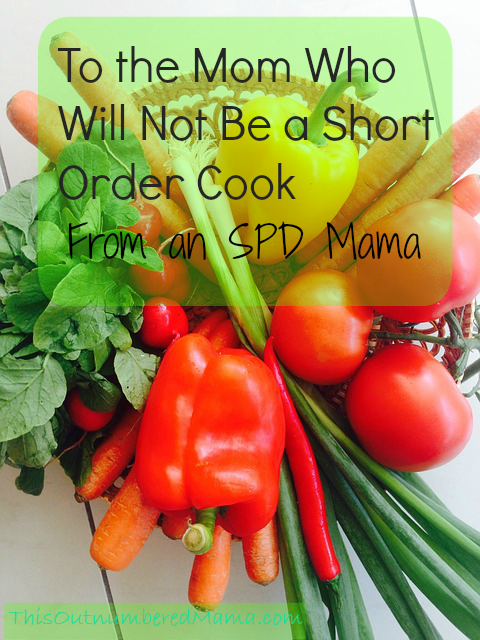 I have always been determined that I would not find myself becoming a “short order cook.” However, having a son with ASD and SPD has taught me to be more flexible and more accommodating, Especially, when it comes down to a a question about whether or not he will eat. I think that outsiders who view our situation, do not understand that our children will simply refuse to eat. Tantrums and Meltdowns will ensue, however, even after the storm settles, due to their sensory issues, they simply not eat the food, if it is not on their preferred list. I have had many well meaning onlookers tell me that if he gets hungry enough, he will eat it. That’s not at all the reality. I have found ways to compromise by making meals that my overall family will enjoy. This means, if we are having protein, rice and a veggie, my son for instance will eat rice and a few veggies. I select the veggies he will eat, which fortunately the rest of our family enjoys, and since he will not eat any protein that isn’t somehow processed or shaped, I will give him chicken nuggets or a hot dog. It’s not the best, but I feel a little better knowing he has gotten the veggies and the rice, and not everything on his plate was processed and artificial. The struggle is so real. I truly enjoyed reading this!